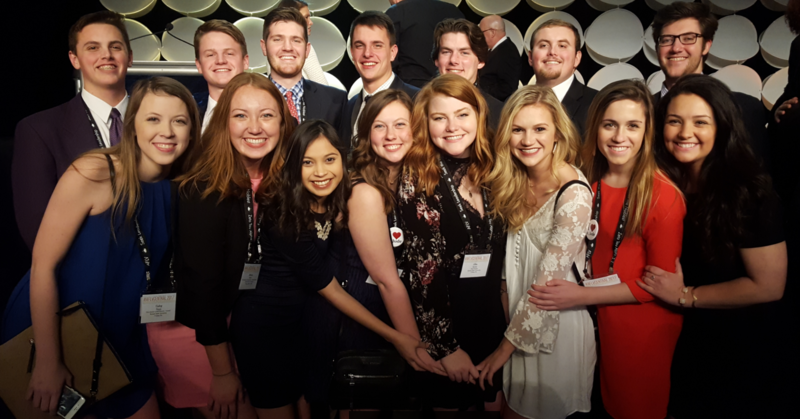 The K-State Panhellenic and Interfraternity communities had an incredible 2016, which was recognized at the Association of Fraternal Leadership and Values Conference February 2-5 in Indianapolis. The 2016 Panhellenic Council was recognized for Excellence in Membership Recruitment, Philanthropy & Community Service, as Risk Reduction & Management. Members of K-State’s Panhellenic and Interfraternity Executive Council pose for a picture at the AFLV Conference in Indianapolis, IN. Fraternity and sorority life continues to grow. In August, 649 women joined the Panhellenic community and 450 men joined IFC fraternities. The total population on the final grade roster is 3,900. That is up 542 members since spring 2014. Scholastic achievement continues to be the leading priority of the 3,900 women and men involved with one of the 25 IFC fraternities and 13 Panhellenic sororities. For the past 51 consecutive semesters, the all fraternity and sorority average was higher than the all undergraduate average. In December, 190 fraternity and sorority members graduated. The 1,654 men in the fraternity community earned a 3.134 gpa. A total of 216 men achieved a 4.0 this past fall. It also has 229 first generation students. There are 475 men in the college of engineering or 28.7%. With 468 men in the college of business, 28.3% study in that field. The 2,246 Panhellenic women earned a 3.352 gpa. With 30.8% of women studying in a major with in the college of arts and sciences, it has the largest concentration of sorority women. Architecture has 52 women, or 2.3%. More than 24 percent of the PHC membership earned a 4.0 in fall 2016…that’s 540 women with 4.0s this fall. A total of 757 members earned a 4.0. Of that number 317 have a cumulative 4.0 gpa. Besides succeeding academically, the 13 Panhellenic chapters alone raised more than $96,000 last spring alone. The 25 IFC fraternities donated more than 26,000 hours of community service this past year. In December, the 2017 Panhellenic Council and Interfraternity Council board of directors were elected and installed to lead their respective communities. Lucas Renz, president, junior in marketing, minor in political science from Salina. Matt Keener, vice president, junior in economics from Ellsworth. Jack Nolte, director of risk management, junior in microbiology, pre-med, minor in Leadership Studies from Hiawatha. Dallas Ungerbuehler, director of public relations, sophomore in mass communications, minor in leadership studies from Overland Park. Carson Lilley, director of community and internal relations, junior in industrial engineering, minor in natural resource and environmental science from Overland Park. Mark McDermed, director of recruitment, junior in finance, pre-law from Atchison. Ellie Herter, president, junior in secondary education: English, pre-law, minor in CATS from Prairie Village. Marisol Garcia, vice president and judicial affairs, junior in history, pre-law, minor in leadership studies from Wichita. Sarah McConnell, director of risk management, junior in life sciences, pre-med, secondary major in gerontology from Salina. Cooper Allison, director of public relations, sophomore in mass communications, minor in hospitality management from Wichita. Carly Wright, director of community and internal relations, junior in political science, pre-law, minor in Spanish from Clearwater. Gaby Riggs, director of recruitment – external, junior in marketing, minor in Spanish from Lenexa. Xena Moore, director of recruitment – internal, sophomore in biochemistry, pre-med from Lenexa. Allison Sears, director of recruitment – COB and retention, junior in family and consumer science education from Plainville. The K-State Fraternity and Sorority community is dedicated to the personal and professional development of members through a wide range of activities and experiences. We are committed to promoting life-long involvement in individual organizations, as well as our collective community to positively impact the lives of both undergraduate and alumni members while building and maintaining a fraternity and sorority community worthy enough to serve the University and the people of Manhattan.